Incidents of child abuse are on the rise in the United States, with some county child abuse prevention organizations reporting they've seen as much as a 65% increase in the need for their services since the middle of this year. Global economic downturns traditionally lead to greater incidents of child abuse, as over-stressed families struggle to cope with an inability to make ends meet. There's the mortgage crisis that has already affected millions of people. Collectively, housing values have already plummeted to the tune of more than $2 trillion. People are holding mortgages that are far greater than the value of their homes. With no means to make their payments, many are losing those homes. This mortgage crisis is only the first wave. The second wave will hit very soon and continue for at least another couple of years as special mortgages that were written up with as little as 1% rates begin to reset at rates that will drive monthly mortgage payments up by double, possibly more. American housing losses are expected to exceed $4 trillion. In other words, more people will lose their homes, which will subsequently leave even more children at greater risk for child abuse. The mortgage crisis is only one of many factors in the economic crisis we are smack dab in the middle of. Some families have lived beyond their means using credit for so long, they have no idea how else to live. And then there are the desperate families that have had to use credit for their basic needs, such as food and clothing, but now have had that lifeline cut as credit card companies and other creditors are calling in unpaid balances and outstanding loans. Even when those balances are not being called in, credit card companies have gotten away with increasing rates on the sole basis of a person's inability to pay. The government is finally interceding by making such unfair practices illegal. Food banks are more challenged than ever to meet the demand, as demand is on the rise while donations are on the decline. Spokespeople report that never before have they had so many waiting in line for food hampers where the parents are working full time. Then there's staggering unemployment. If unemployment hasn't already hit a family, there is the constant threat of it. The very existence of some communities is on the brink because the main employers of towns across the nation face bankruptcy and possible shut-down. Such shut-down bankruptcies trickle down throughout the businesses in each of these towns—towns may be all but deserted. This trickle down effect can also cross state lines and international borders; General Motors is a prime example. They announced they are shutting down 30 of their plants in Canada and the U.S. for at least a month. If this happens, companies in the business of building parts will also have to shut down, which will lead to other shut downs of businesses that rely on each other to stay afloat. The children of these affected families will be at risk. Even families who have known only affluence are now dealing with financial losses of every kind, the most recent of which may be tied into the $50 billion investment scam believed to have been masterminded by former NASDAQ chairman Bernard Madoff. Many have lost their pensions. Some have lost every dime they had. While it may be difficult for those who have always struggled to make ends meet to feel empathy for those who have never before experienced hard times, one must keep in mind the children of these families; because regardless of socio economic status, it's the children who ultimately bear the brunt of financial losses. Does the answer lie in government bailouts, prosecutions for abuse offenders, and placement of abused children in foster or group homes? Stimulating the economy is critical, but this article isn't about solving the economic crisis. It isn't about dealing with child abusers after they have abused or with placing children after they've been abused. This article is about prevention of child abuse, and what families need to do in order to lessen the impact of their financial woes, and thus the impact on their children. The "nuclear family" may well have to be replaced with the "extended family", and follow the "family as a self-sustaining community" path of generations gone by. Families may have to revert to living together, where Grandma and Grandpa and brothers and sisters live in the same house in order to relieve the financial burden for each of them and share in the child-rearing responsibilities. Even if the government intervenes with bailout after bailout on both Wall Street and Main Street, if individual family members aren't willing or able to come together, the children of these families will continue to be at risk because even government bailouts can't "save" everyone. I believe the answer to child abuse prevention lies in the community of a supportive family, even if that supportive family is a "chosen" one. 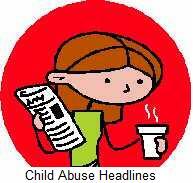 Offer your comments to "The Child-Abuse-Economic-Downturn Connection" at Comments below this child abuse article.